Our homecoming was this past week, and while it's a ton of fun and full of great experiences for our students, there's lot of new experiences. One of those being the school assembly! It's loud, different, and new! We prepared for the assembly in the funnest way I know how....BINGO! I went though all of the cards as I would in a social story type of way. If that doesn't make sense, here's an example. "Today after class we are all going to go to the...'GYM!' In the gym we will sit on the bleachers and Mrs. Holtrop, Annie, Megan, and Kathy will all sit on one side because they are all....'GIRLS'. The 'MARCHING BAND' will play and it might get kinda 'LOUD.' If it's too loud for you, you can wear...'HEADPHONES'. You kinda get the progression. 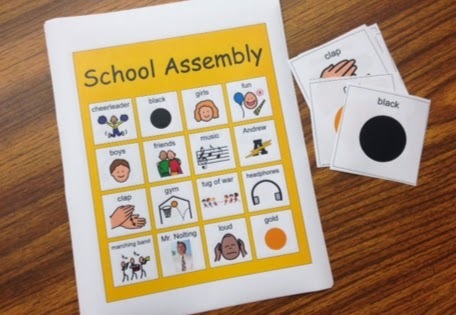 I uploaded the school assembly boards and calling cards to BoardMaker Online, so if you want to download it and edit to fit your school you can do so! Just switch the school, principal, and colors and you should be good to go! Our school does competitions between girls and boys, but you might want to switch those to grades with a couple others if your school does something different. I hope this Bingo game will help your students prepare for a pep really or school assembly as well! Thanks! Our homecoming is this week, so this will be perfect, especially since I finally got Boardmaker! !